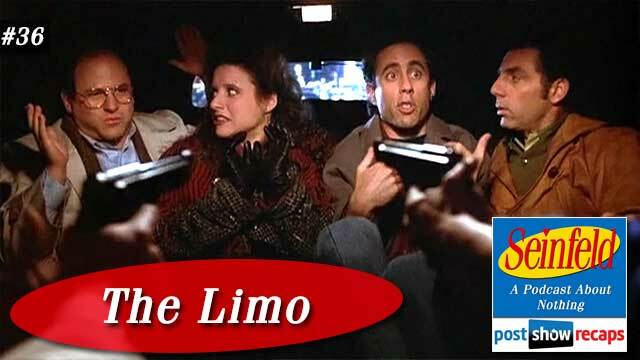 Rob Cesternino and Akiva Wienerkur got together for another Seinfeld recap, this time, covering “The Limo”, which first aired on February 26, 1992. There was little news to cover, but Akiva did share that Montreal Expos fans were not happy with how he thought of the team when he and Rob discussed Gary Carter last week. Jerry’s opening standup was about how the airport is a reason for a restaurant to charge exuberant amounts. Rob and Akiva both are leery of buying any food at the airport, and not just because of the price. The episode begins with Jerry at the airport waiting for George to pick him up, though his car broke down and now they both need a ride. They notice a limo driver holding a sign for “O’Brien”, who Jerry learned is stuck in Chicago. George talks Jerry into pretending to be O’Brien so they can take the cab home. Akiva liked this plan, assuming the person isn’t as controversial as O’Brien. When in the limo, George says something inappropriate to test if the driver can hear them. Rob wondered why George didn’t just ask the driver to stop at McDonalds or something, rather than risk getting punched for his rude comment. After George calls his mother on the phone there, Jerry calls Elaine to invite her and Kramer with them, since they think they are going to the Knicks game. When the driver pulls off an unexpected exit, they learn that they are picking up the “other members of their party”, Eva and Tim. Jerry and George panic, and decide that George will hide his face until they figure out if the other two know what he looks like. When they learn that they don’t, George pretends to wake up from a nap. Rob pointed out that the actor playing Tim is Peter Krause, from Parenthood and Six Feet Under fame. While talking, all they learn that O’Brien is the writer of a book called The Big Game. , Eva is talking about how she memorized O’Brien’s whole book, and how it had such an impact on her life. Jerry and George learn that O’Brien is supposed to be giving a speech tonight. When Eva shows him the transcript, they learn that O’Brien is a leader in the world of white supremacy. When a tire blows in the limo, Tim and Eva pull out guns, thinking that someone is trying to infiltrate. Rob was not on board with this scene, being that Seinfeld is supposed to be a show about nothing, and this was too heavy. The scene cuts to a news reporter with protestors waiting outside Madison Square Garden for O’Brien. Akiva shared that he’s been to many protests while in high school. Back in the limo, George is getting into the idea that Eva worships him, and Jerry has to remind him that she’s a Nazi. They want to make a run for it, but George has a bad hamstring and can’t. He decides he’ll call the police, but Tim comes back in, foiling that plan. When George asks Tim for privacy, Tim says they have to get to the speech. George arrogantly reminds Tim that he is a leader of hate mongering, and deserves respect. Rob thought this was the funniest moment of the episode. Jerry and George decide that once they get into the city, they’ll make a run for it when there’s people around. Kramer comes to the conclusion that Jerry is actually this Nazi O’Brien, and Elaine comes to Jerry’s defense. Rob felt Elaine standing up for Jerry so vehemently meant that she must still be in love with him. When the limo picks them up, Kramer accidentally calls them by the opposite name. Kramer picks up the ringing phone, which turns out to be O’Brien himself, which unravels the whole story. When Tim and Eva point guns at them, they all try to blame each other. When forced out of the limo, the protestors rush them. The episode ends with a news clip of George exclaiming he is not O’Brien. Jerry’s last standup is about how there must have been an official and a casual heil. Before getting to the emails, Rob shared that they had a special guest, Marc Jaffe, the writer who came up with the original idea and outline of the episode. Marc shared that he used to be a standup comedian, and reached out to Jerry after watching the first few episodes of the show, knowing it was a perfect fit. Akiva had learned that Marc’s wife was a Moyle, and wondered if the Seinfeld episode was based on that. She had become one after that though. Rob next asked about his book Sleeping With Your Gynecologist, which was about his wife and other Ob-Gyns’ interesting stories. Before signing off, Marc shared a story about how Larry David was visiting his hometown Cleveland to take part in the John Kerry campaign, that Marc was also a part of. When it came time to pick up Larry from the airport, everyone thought Marc could do it since they knew each other. When Marc waited for him at the airport, he held a sign saying O’Brien, getting a big laugh from Larry. In analyzing if this episode could take place in 2015, Akiva felt this one more than any other could not. O’Brien would have been seen by a simple Google search, and he would have had a cell phone to get in touch with the limo driver, Eva or Tim after he missed the flight. Akiva thought this was a tough one to rank, since it was memorable, but not quite the caliber of “The Boyfriend”. He ranked it at 48. Rob thought it was worse than that, but knew that his opinion is in the minority. There were a few emails to go through for this episode. Chelsea had a question about last week’s episode, asking if they would ever tell off an athlete for poor performance. Akiva said he wouldn’t heckle a player, while Rob agreed. Both thought they might boo, but only if for a poor effort. Darren wanted to share his thoughts about handshakes, ending his comment with kudos to them both for putting out a great show. Johnny De Silveira clarified his sports rooting that the guys commented on last week, adamantly claiming he is not a bandwagon jumper, just adopted some teams later in life. He asked if O’Brien was based on the white supremacist David Duke. Akiva thought since Duke was mentioned in the show, that he assumes yes. Susie wrote in to share how much she enjoyed seeing Larry David on Comedians With Cars Getting Coffee. Travis wanted the guys to rank the Kramer physical comedy thus far. Akiva thought that Kramer’s imitation of Michael Jordan’s dunk was third best, pouring the cement in the washing machine was second, and riding the horse at the OTB was the best. Chester suggested a derogatory hash tag that the guys turned down, and he had a few comments about some inconsistencies from the episode. Tune in next week as the guys will recap “The Good Samaritan”, which was the one episode directed by Jason Alexander. Don’t forget to subscribe to the podcast by going to postshowrecaps.com/seinfeldITunes, where you can rate and review the podcast. You can get your questions to the guys by emailing [email protected] , and follow them on twitter @robcesternino and @keev26.